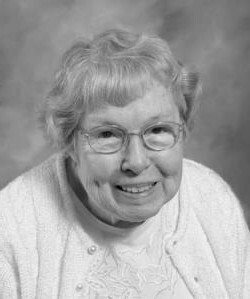 Sister Elenita O’Callaghan (Helen O’Callaghan), a Pittsburgh Sister of Mercy for 74 years, died at the Convent of Mercy on February 1, 2019. Born in Pittsburgh, Pa. she was 97 years old. Daughter of Richard D. and Hannah (White) Nolan, Sister Elenita entered the Sisters of Mercy from St. Agnes Parish in Pittsburgh in 1945 and made final vows in 1950. She received a Bachelor of Arts degree from Mount Mercy College (now Carlow University) and spent 25 years teaching in Catholic schools in the Dioceses of Pittsburgh, Greensburg and San Juan Puerto Rico. Locally she taught at St. Xavier, Latrobe, St. Peter, McKeesport, St. Paul Cathedral, St. Colman and St. Maurice. From 1971, Sister Elenita served the Pittsburgh regional community as secretary in the administrative council offices until 1984. From 1984 to 1991, Sister Elenita was manager of Mercy House, the housing for family of critically ill, out of town patients at Mercy Hospital. After retiring from that position, sister began her work in the academic affairs office of Carlow College. She spent more than 10 years in a support role for that office in addition to maintaining all the records of the Sisters of Mercy in Pittsburgh. Sister Elenita used her gift of organization in service to others. Usually quiet and serious, her sense of humor shone through at the most unexpected times when she saw the incongruity of a situation. Sister Elenita was preceded in death by her parents and stepmother, Ellen Noey Holleran O'Callaghan and also by her brothers John B. and Thomas R. Holleran, George T. O’Callaghan, Richard (Bud) and sisters Hannah Therese Edlis, Mary Louise Weber and Rose Molnar. Sister Elenita is survived by a sister Catherine O’Callaghan of Houston, TX. Additionally, numerous nieces and nephews survive. Friends will be received Sunday, February 3 from 2-7 p.m. and Monday, February 4 from 9-10:45 a.m. at the Convent of Mercy, 3333 Fifth Avenue. Funeral Mass will be celebrated Monday at 11 a.m. in the Chapel at the Convent of Mercy, followed by interment in St. Xavier Cemetery, Latrobe. Arrangements entrusted to the EDWARD P. KANAI FUNERAL HOME. In lieu of flowers, donations may be made to the Sisters of Mercy, 3333 Fifth Ave., Pittsburgh, Pa. 15213 or Carlow University Endowed Scholarship Fund.